A playhouse is a wonderful gift to give your kids. It provides a safe place they will enjoy playing in for many years, in the comfort and safety of their own badkyard. It encourages kids to get away from the TV and the video games and play outside in the fresh air, in the company of other children. It also gives them an opportunity to engage in imaginative, self directed play. They get to make up the games and the rules, and to be the boss for a little while. Psychologists will tell you this is very important to a child’s growth and development. 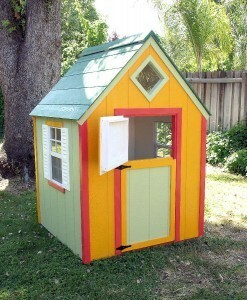 There are many kinds of playhouses available, in a variety of price ranges. Here are some important points to consider when choosing for yourself and your kids. If you are in the market for an outdoor playhouse then you have to consider the size of your yard and the size and shape of the playhouse space itself. Check the dimensions carefully so will know your size constraints. Also, consider the ground surface. Is it grass, gravel or concrete or earth? Is it flat and level? An outdoor playhouse needs to be on a flat, level surface for the best stability. And it should be assembled on a hard surface that will keep it from sinking and protect its base from dampness that may ebventually cause it to rot. It may be necessary (or at least recommended) to install a cement pad, decking or gravel before the playhouse can be installed. Try to choose an area of the yard that gets plenty of sun and fresh air. It should be somewhere you can easily keep an eye on the kids too. Keep the area clear of tree stumps and sharp or otherwise dangerous objects that might be a hazard to your kids. if your yard has sprinklers, try to direct them away from the playhouse. Constant water spray will increase wear and tear to the exterior of your playhouse. And don’t forget about your own comfort. Try to situate the playhouse such that it allows you and your spouse and friends to continue to enjoy the yard as well. How large should the playhouse be? This is determined not only by your available space, but also by the number of children you have and how many friends you expect to have hanging around your house once you are a playhouse owner. You will probably want ot furnish your children’s playhouse to some extent so they can enjoy those tea parties in comfort, so keep that in mind when determining how many kids will fit inside comfortably. For example, our 6′ x 6′ Enchanted Cottage can accomodate 4 kids when empty, or 2-3 kids furnished. The 8′ x 8′ version can easily handle 6-8 kids furnished. If you don’t have much available space in your yard, or if you have an unusally shaped space, or even just a patio area (for example, in a condo), it may still be possible to get your children a playhouse. We have a 4′ x 4′ playhouse called The Garden House that will fit in a very small area. And we have custom built larger playhouses for unusal spaces. For example, our Suwara House was built for a family that had only a very deep and narrow space available. If you decide to go for a larger playhouse you should also consider the building laws in your city, you may have obtain a permit before beginning construction. Also, the playhouse size may determine how the playhouse will be built and assembled. Our smaller playhouses, up to 6′ x 6′, are built in our workshop, delivered as a group of panels and then assembled onsite. Our larger playhouses are generally constructed entirely onsite. A wooden, outdoor playhouse is a large, solid structure (or it should be). Plan on it adorning your yard for years to come. So you should choose a playhouse that suits your yard in terms of style and color scheme. 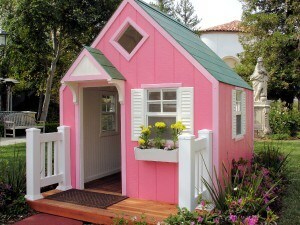 Our playhouses can be designed to any stylistic specifications and you can choose any colors you wish. Consider the building materials used in your playhouse. Our playhouse walls and roof are constructed of LP SmartSide siding. It is a manufactured wood with all of the warmth and beauty of traditional wood plus the durability and workability of engineered woods. It is devoid of knots and voids and resistant to rot and termites. And it is made from trees grown in accordance with Sustainable Forestry Initiative® standards, so it is kind to the environment. Copyright © 2007-2019 Folk Art Playhouses. All rights reserved.